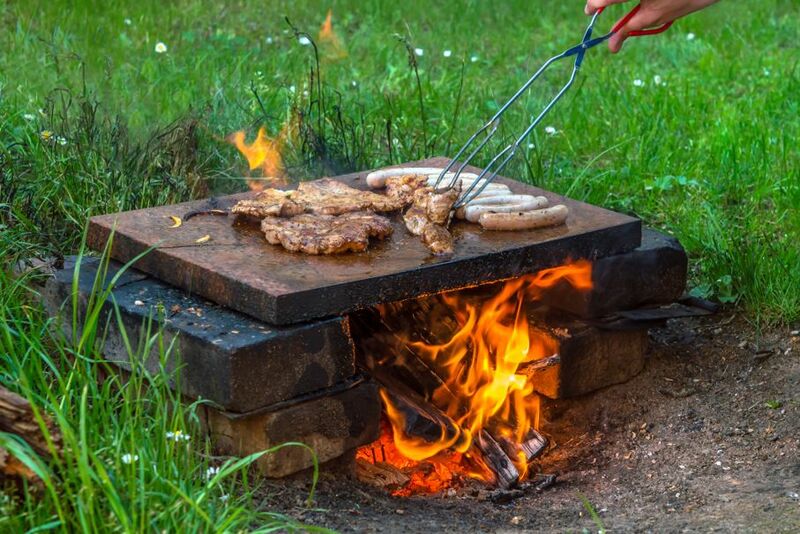 Have you tried grilling with granite? 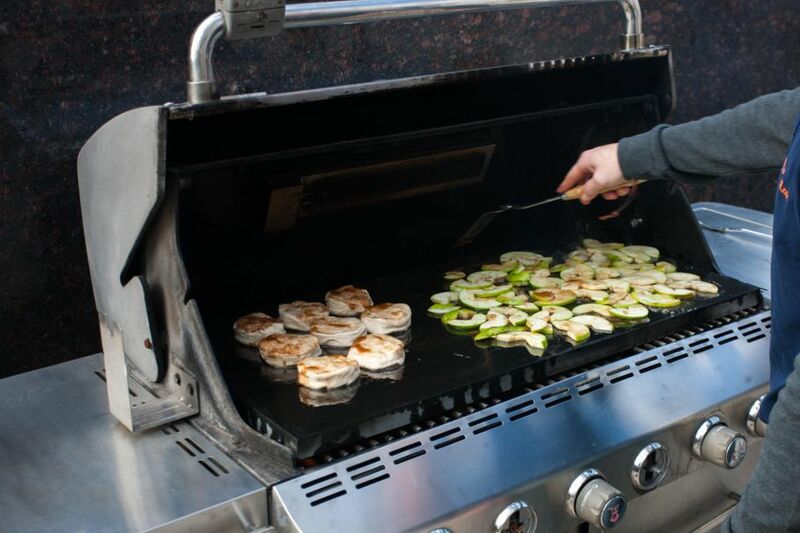 It's a fun and functional way to prepare items that would normally fall through your grill's grates. Grill pizza, eggs, fish, veggies & more! Have you tried grilling with granite? If you haven’t, you’re missing out. In fact, granite is one of the best cooking stones to work with, whether you’re baking bread in the oven or grilling a pizza over a charcoal grill. The last time I made a homemade pizza, I knew that baking it in the oven just wasn’t an option. After all, I spent all that time making the dough, stewing the sauce, and even stretching my 30-minute mozzarella. Why wouldn’t I take the time to cook it the right way? 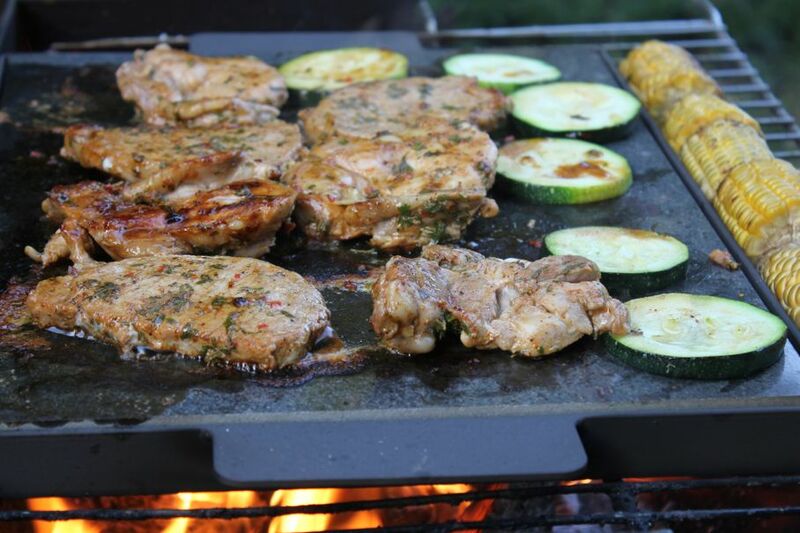 Using granite slabs on your grill is an easy, affordable, and delicious way to prepare and enjoy your food. Here’s how to get and use a granite cooking stone. Purchasing granite is a breeze. You can choose to search on the web or in-person at a local granite store to find a slab that matches your kitchen’s decor and meets your sizing needs. Most retailers and suppliers working with natural stones like granite sell remnants perfect for cooking for a fraction of their original cost. If you can’t find what you’re looking for, don’t overlook home goods and kitchenware stores. The ideal granite grilling stone is small enough to fit on your grill or in the oven, so look for slabs between 12”-14” in width and 8”-10” in length. Anything bigger may wind up being a bit too heavy to carry from one room to the next. Ever so often, granite distributors use a sealant to protect the stone from common countertop wear and tear. If possible, look for granite without a chemical sealant. For slabs with sealant, heat the slab in an oven at 400 degrees for 2-3 hours to help remove any remaining sealant before cooking on it. Have you ever noticed that granite, like other natural stone, is quite cool to the touch? While it may seem counterproductive to use a “cold stone” to heat up your food, that naturally cool temperature is a great indicator of temperature absorption. When using granite to cook in the oven or grill, remember to properly heat the slab just as you would a clay pizza cooking stone. Your best bet is to heat the slab on a grill for at least 20-30 minutes before grilling (for both propane and charcoal grills). You may be wondering: what temperature can granite withstand? Don’t worry about damaging the granite with high temperatures. Most granite can easily withstand temperatures of 400 degrees or more. Let’s get down to some brass tacks. 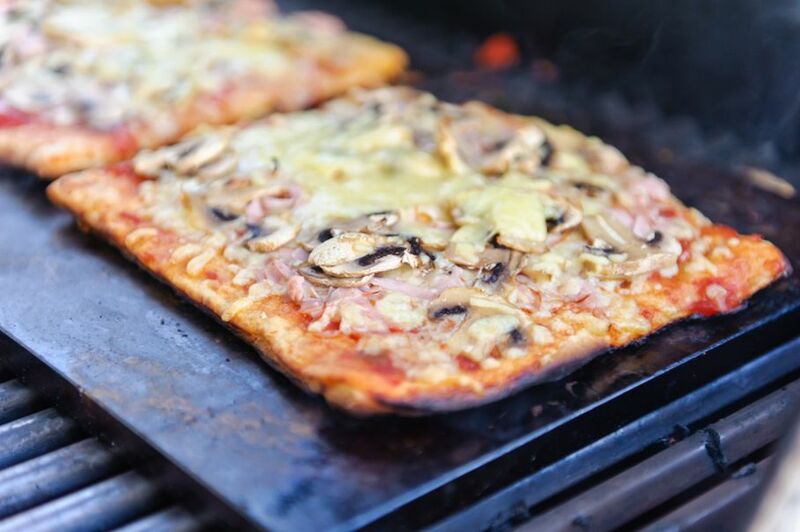 If you’re thinking about using a granite grilling stone, chances are you’re thinking about how to grill pizza. 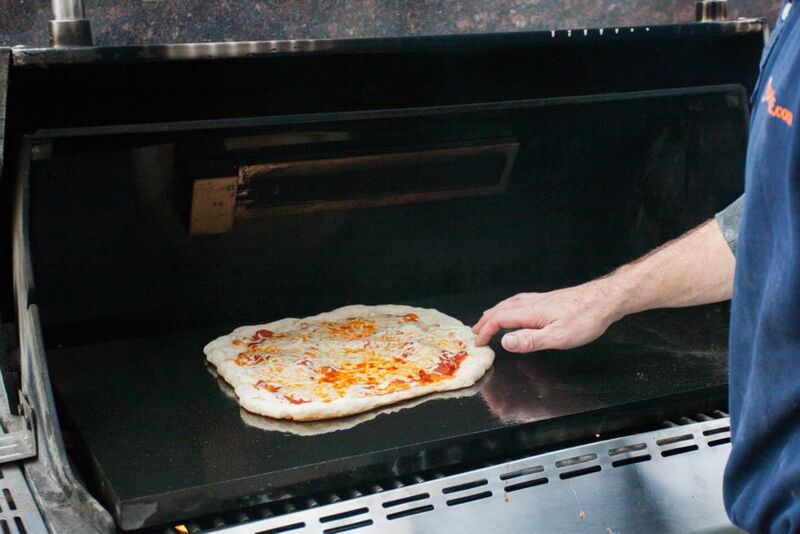 To grill the perfect pizza, start by heating your granite slab. While that’s happening, roll out the pizza dough on a cool, clean surface such as a marble cutting board or granite countertop. Use a small dusting of all-purpose flour to keep the dough from sticking. Place the stretched dough on a metal or wooden pizza peel, brush with olive oil, cover with the toppings of your choice and wait until the slab is properly warm. 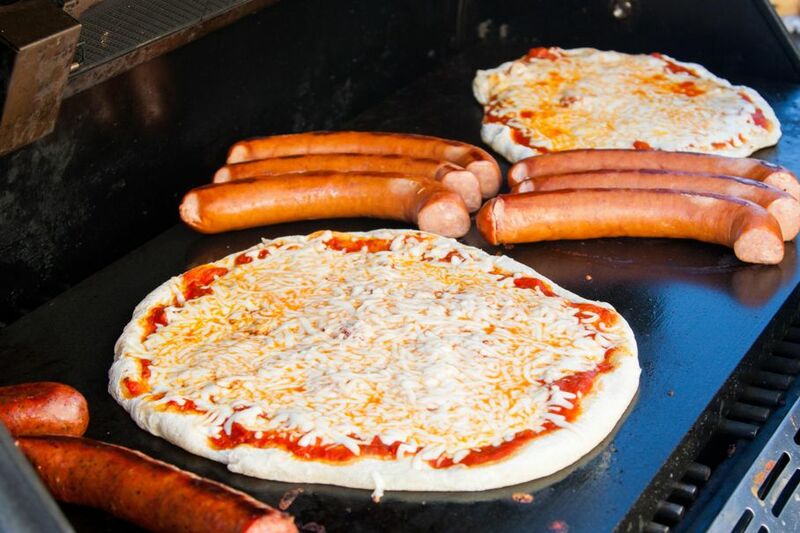 Carefully place the pizza from the peel onto the granite, close the grill lid, and let it cook for 10-12 minutes. Keep close tabs on your pizza. If you notice charring, keep the lid slightly open until the dough is completely cooked through. Luckily, granite cleanup is a cinch. Once the slab has cooled completely, remove it from the grill or oven. Run hot water over it and then clean with a paper towel or delicate sponge without soap. To sanitize, use a 50:50 solution of isopropyl alcohol and water. Store your granite as you would a cutting board for easy access when the time comes to reuse. Look past countertops and consider using granite as your go-to grilling tool. You’ll reap the rewards of even temperatures, hot cooking surfaces and, best of all, grilled-to-perfection pizzas, veggies, fish, and more! Isn’t your mouth watering just thinking about it? 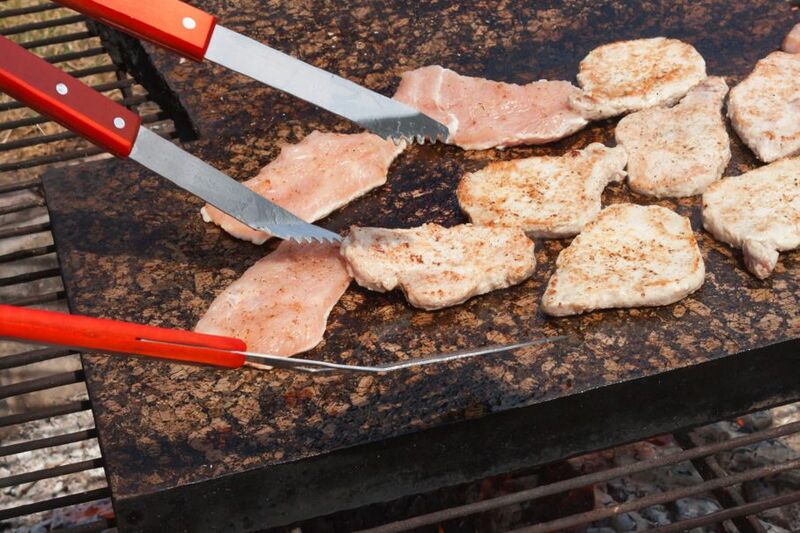 Give grilling with granite a try for your next backyard outing!